From Thomas Sabo Charm Club is this Yellow Gold Royalty Star charm. A stunning addition to any Thomas Sabo charm bracelet. This charm adds a personal touch to a gift for her. 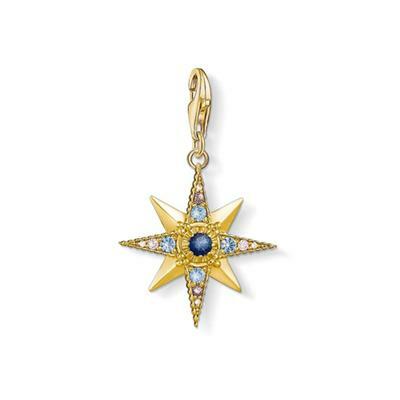 This Thomas Sabo Yellow Gold Royalty Star Charm features an 8 point star design with 4 plain Gold points. On the 4 other points, the star is embellished in Cubic Zirconia stones. These stones give the charm an extra sparkle and makes it stand out. In the centre of the star, is a large Blue Cubic Zirconia stone which adds some colour to the charm and gives it a 'royal' edge. This charm is crafted from 925 Sterling Silver, Yellow Gold plating and Cubic Zirconia stones.